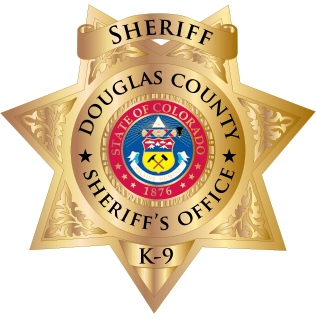 The Douglas County Sheriff’s Office K-9 Unit was established in 1989. The addition of dual purpose, professionally trained K-9s, partnered with a highly skilled deputy, not only ensures a safer community but also saves lives. Since 2011, the DCSO K-9 Unit has been responsible for 10,213 deployments, 827 arrests and 459 assists in surrounding counties, while seizing 356 pounds of narcotics and $460K in cash. Thanks to the commitment of the Douglas County Sheriff’s Office and the support of K-9 Friends, the DCSO K-9 Unit now consists of five Deputy/K-9 teams. Deputy Tim Van Noordt is a Colorado native. He started his career in law enforcement in 2010 with the Douglas County Sheriff’s Office. After working in the Detentions and Patrol Division he was selected to be a K-9 handler in August of 2017 where he was paired with his first dog, Mako. Together they attended training at Gold Coast K-9 and hit the streets in November of 2017. K-9 Mako is a German Shepherd and Belgian Malinois mix who was born in Slovakia. 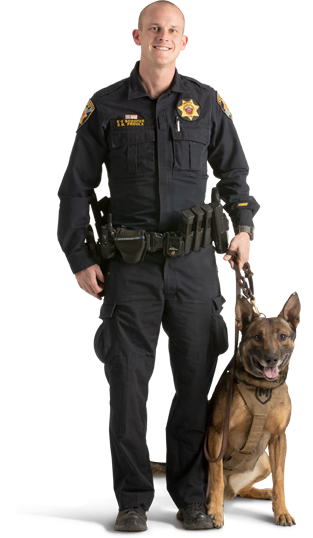 Deputy Kyle Nilemo began his Law Enforcement Career in 2011 with the Cripple Creek Police Department. His career continued with the El Paso County Sheriff’s Office and then the Douglas County Sheriff’s Office in 2015. He served with the Douglas County Region SWAT Team, before becoming a K9 handler in 2017. He graduated from the Gold Coast K9 Dual Purpose handler course, where he was paired with Rudy. Sergeant Todd Tucker hails from the East Coast where he began his law enforcement career as a Deputy with the St. Mary’s County Sheriff’s Office in Maryland in 1996. Sergeant Tucker moved to Colorado in 2003 and joined the Douglas County Sheriff’s Office, working in the Patrol and Traffic Units. He also served on the Front Range Drug Task Force. In 2013 Tucker became a K-9 handler with the Unit and was paired with his first dog, Zoos. In 2016 Tucker was promoted to the rank of Corporal (a first for the DCSO K-9 Unit) and also graduated from the K-9 Handler Instructor course at Vohne Liche Kennels. Deputy Tyler Morris started his law enforcement career as an Officer with the City of Northglenn Police Department in 2008. He joined the Douglas County Sheriff’s Office in 2011, starting in the Detentions and Patrol Divisions. 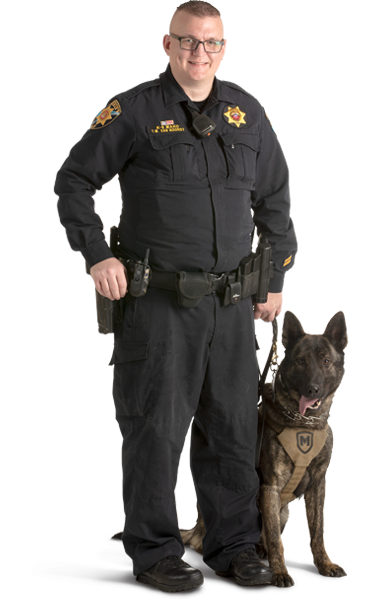 Deputy Morris became a K-9 handler in November of 2014 and graduated from the Dual Purpose Handler Course at Vohne Liche Kennels in March of 2015. Deputy Brad Proulx started in law enforcement in 2011 with the Colorado State Parks before joining the Douglas County Sheriff’s Office. 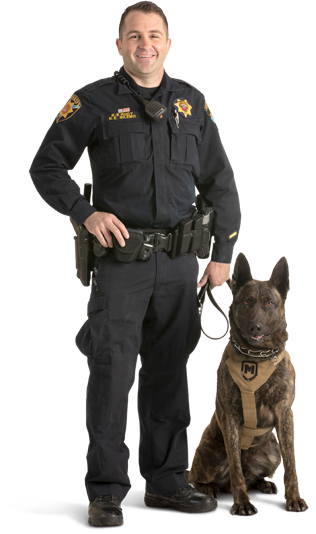 After working the Detentions and Patrols Division he was named a K-9 handler in November of 2014 and graduated from the Vohne Liche handler course in March of 2015. Deputy Travis Kyle’s law enforcement career began in 2008 with the Douglas County Sheriff’s Office Detentions Division. He moved to the Patrol Division four years later, and was then named to the K-9 Unit in 2015. Deputy Kyle was paired with his new partner, K-9 Colt, during the handler training course at Vohne Liche Kennels in July of 2015. Lieutenant Rogers has been a member of the Douglas County Sheriff’s Office since January of 1997. While never having served in the capacity of K-9 lieutenant before, he has taken on this endeavor with great anticipation and excitement to continue the fine tradition established in the preceding years. 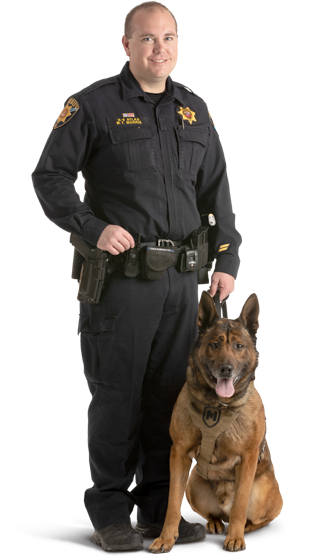 He will continue the focus on training and maintenance of the K-9 unit during his tenure in this assignment. Rogers was promoted to lieutenant in May of 2011 and transferred to the detentions division where he supervised the construction and expansion of the current justice center detention complex. In 2000 he was promoted to sergeant and remained in the investigations division until 2008. In 2014 he transferred back to the patrol division. Sergeant Steve Croushore is a Colorado native. He joined the Douglas County Sheriff’s Office as a Deputy in 1998 and was promoted to Sergeant in 2014. During his varied career at DCSO he has been assigned to Traffic, Patrol, Detentions, Investigations and Internal Affairs. 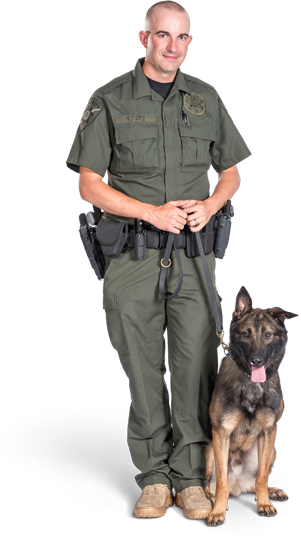 He is currently a Patrol Supervisor and has enjoyed working with the K-9 Unit since 2013. The K-9 Officer Preservation (KOP) Fund ensures every DCSO K-9 receives the same high level of care and compassion throughout their retirement. 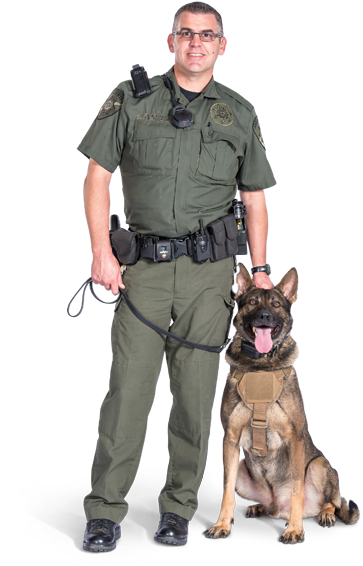 More than 20 DCSO K-9 Officers have served since 1989. With honor and respect, we are grateful for their service.